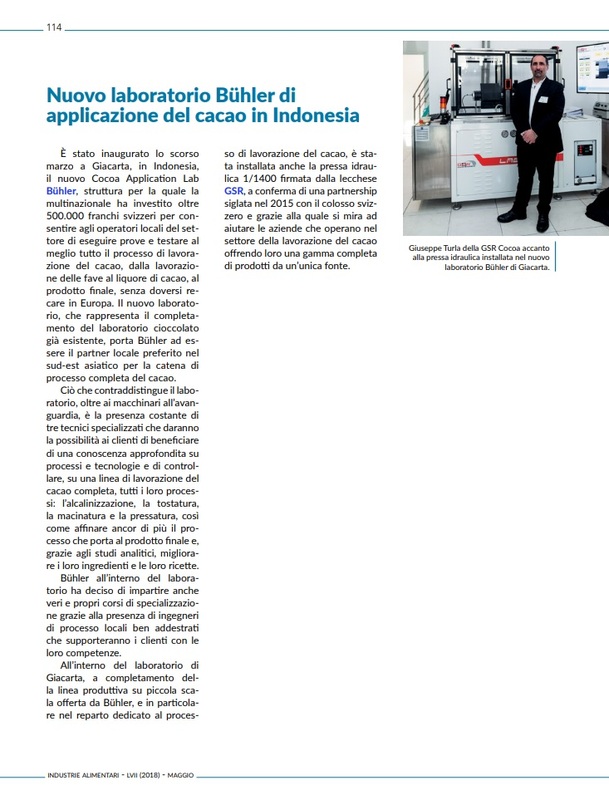 Bühler opens its new cocoa application lab to offer customers process trials from the cocoa bean to the chocolate bar. 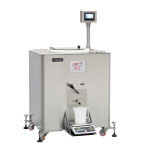 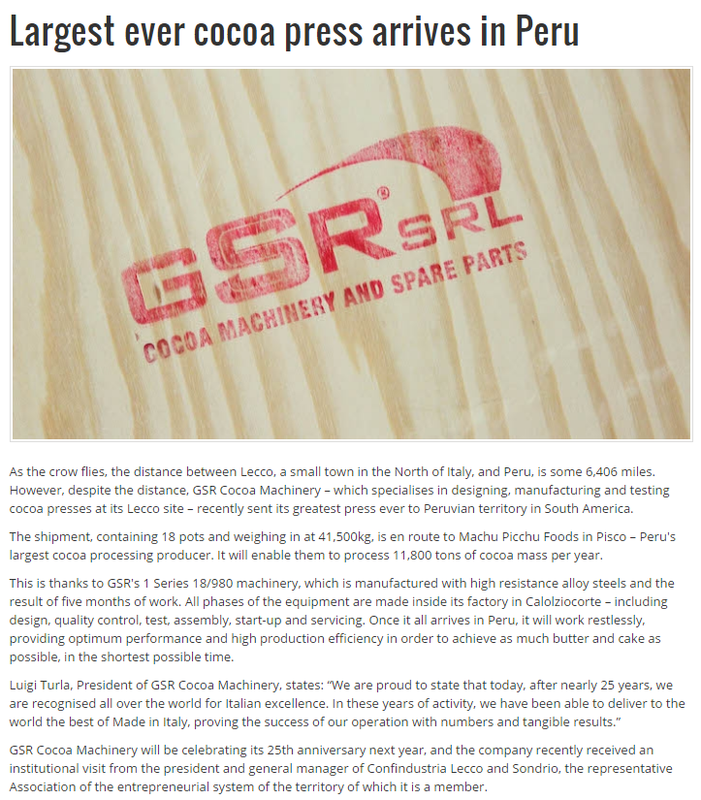 The GSR hydraulic cocoa press 1/1400 was installed inside the laboratory. 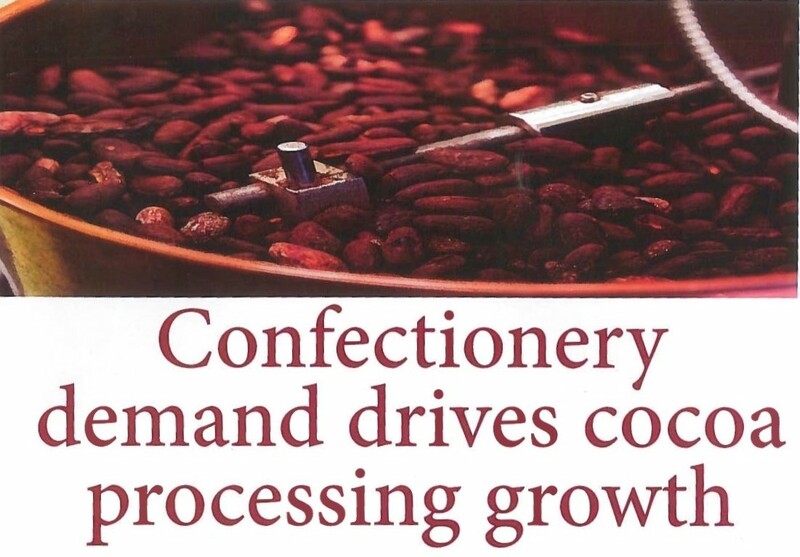 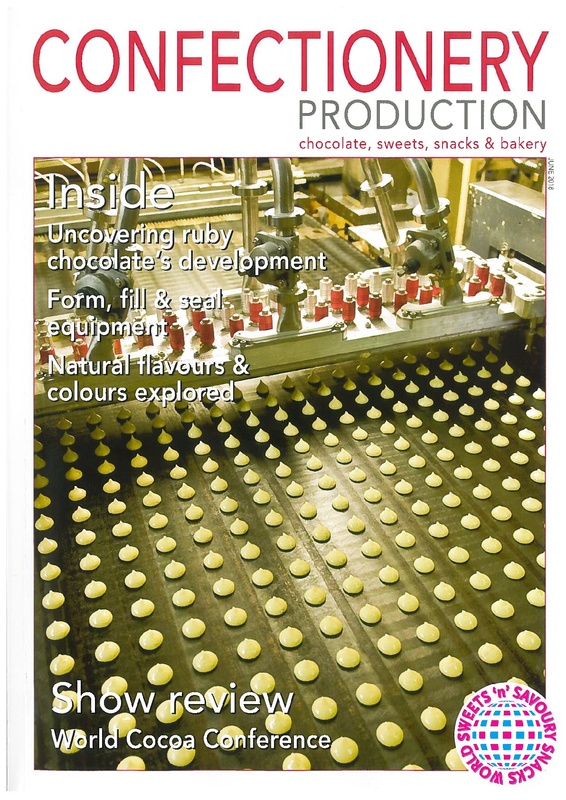 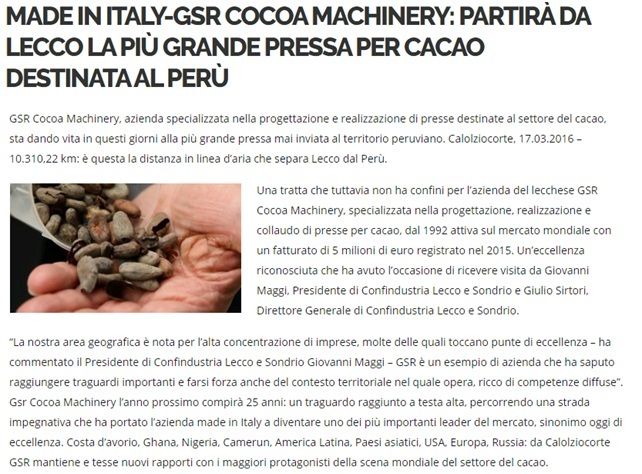 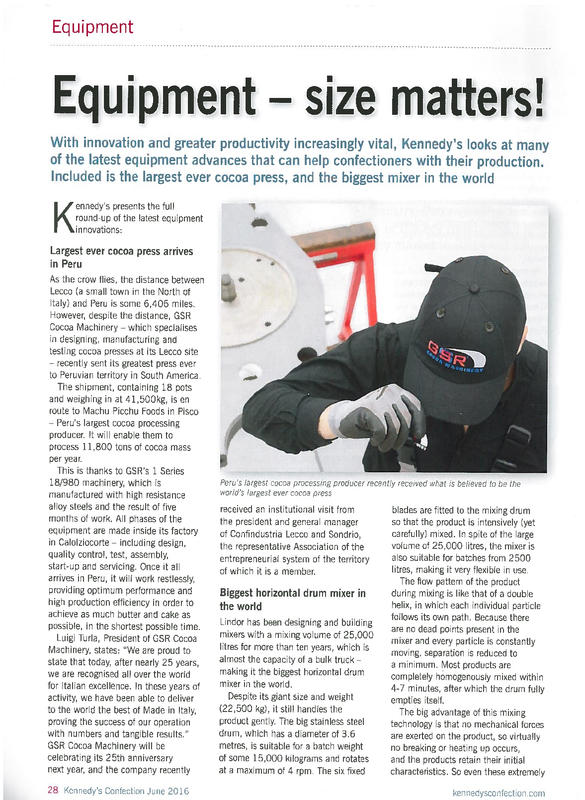 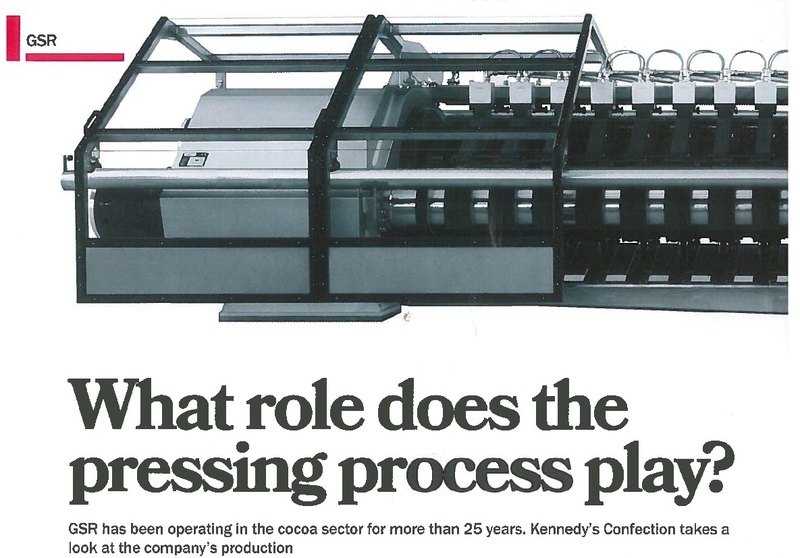 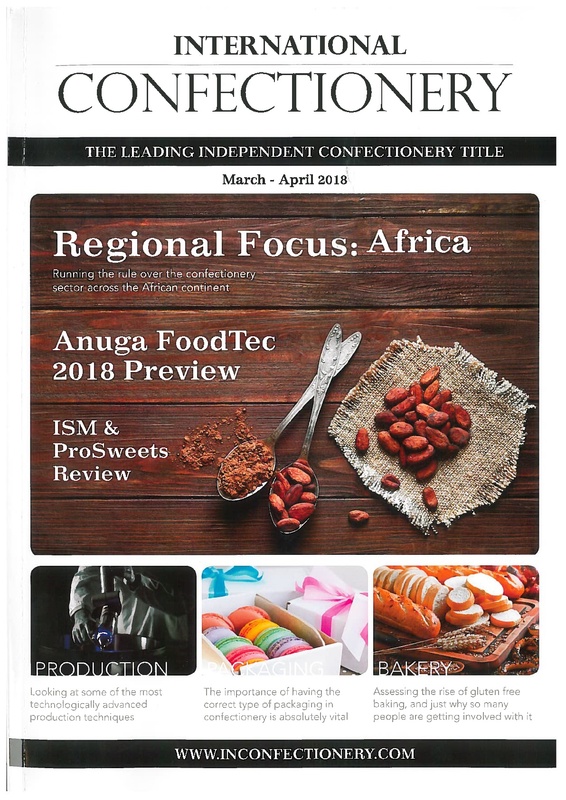 GSR Cocoa Machinery press 20/980 positively influenced the 2018 scenario linked to the transformation of cocoa into chocolate. 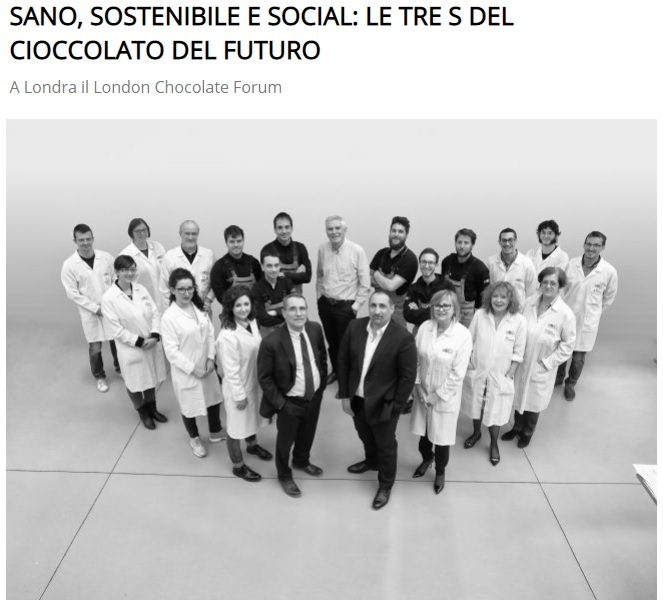 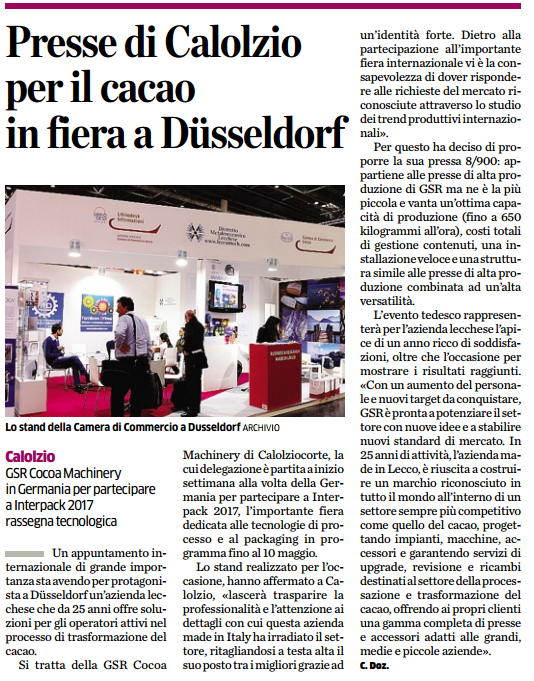 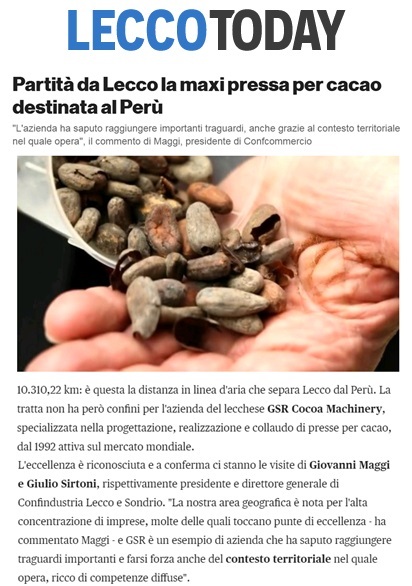 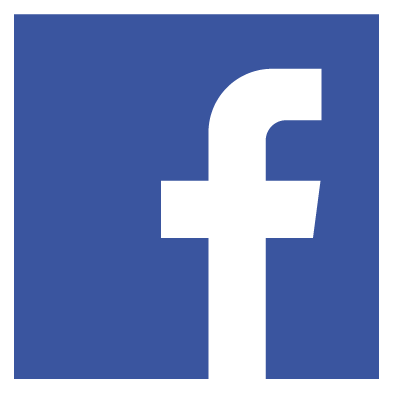 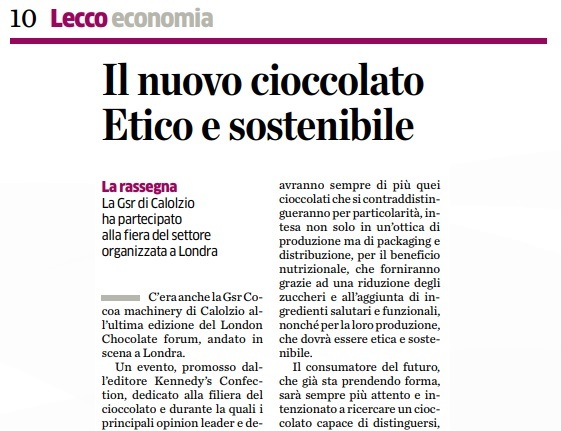 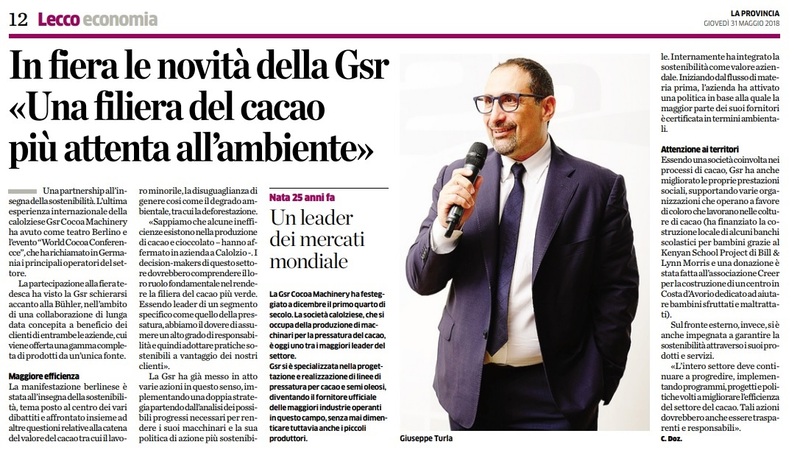 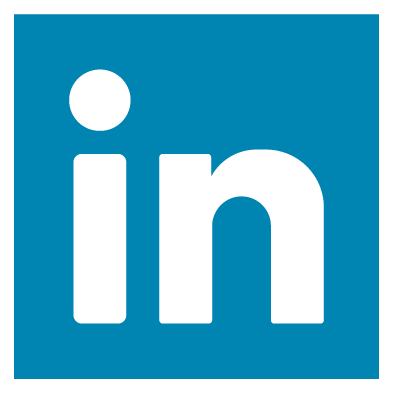 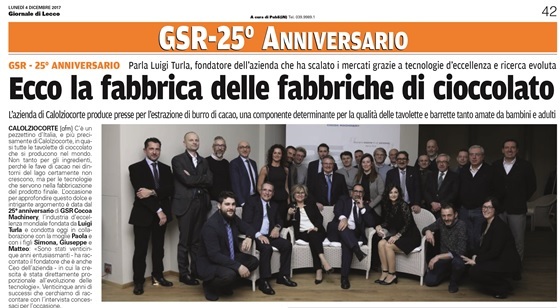 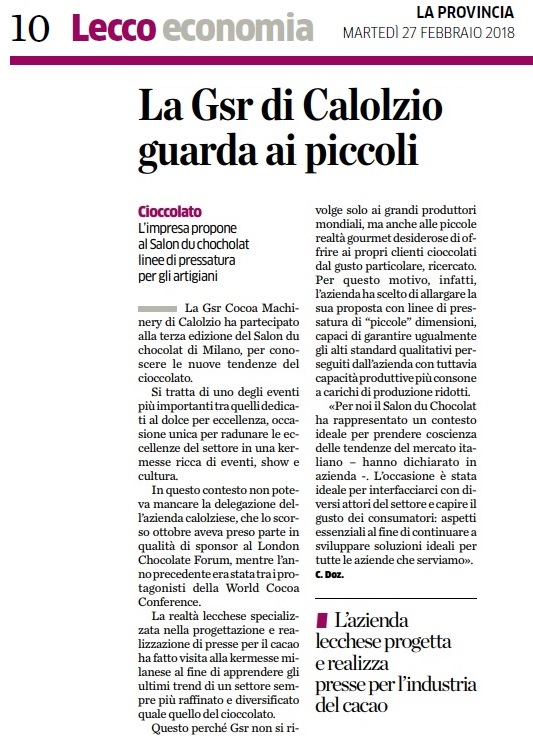 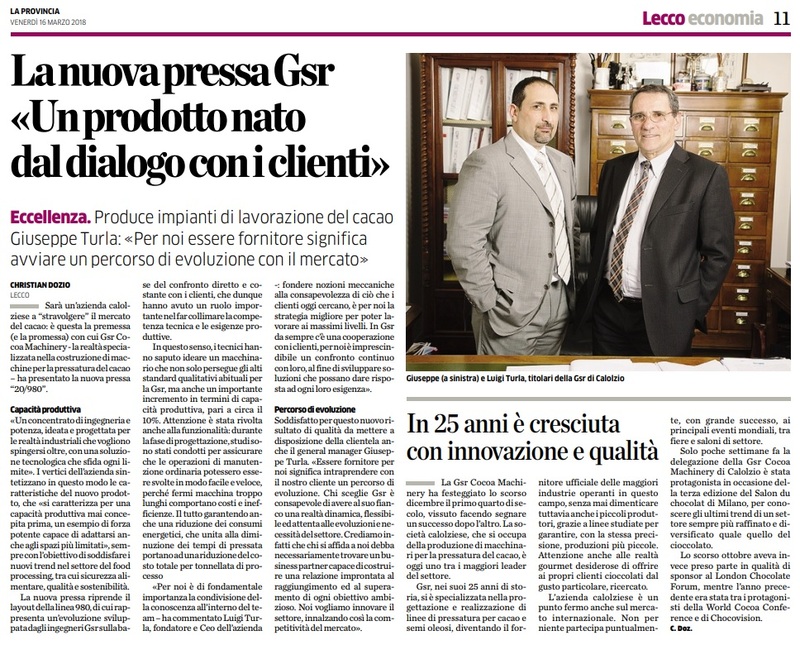 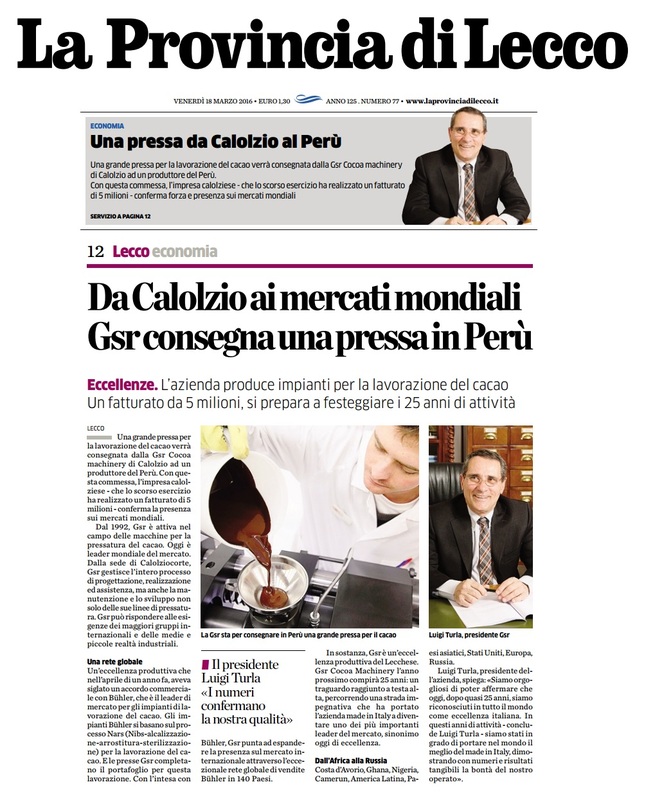 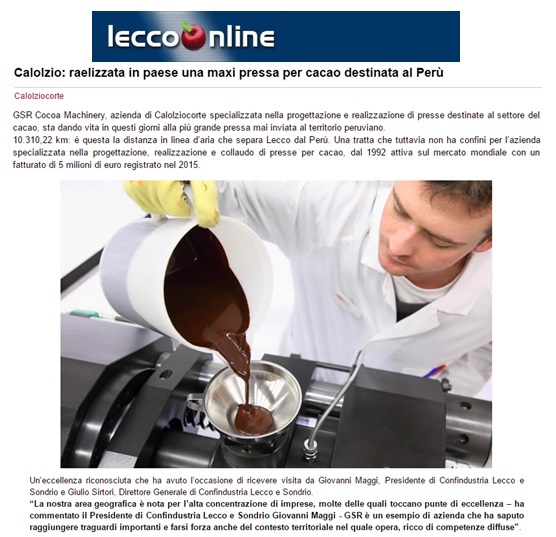 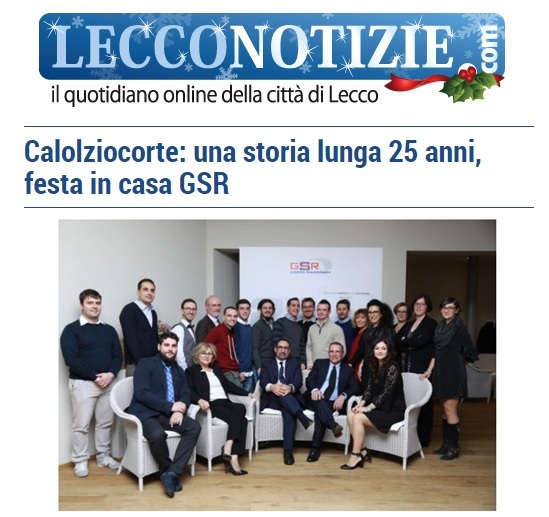 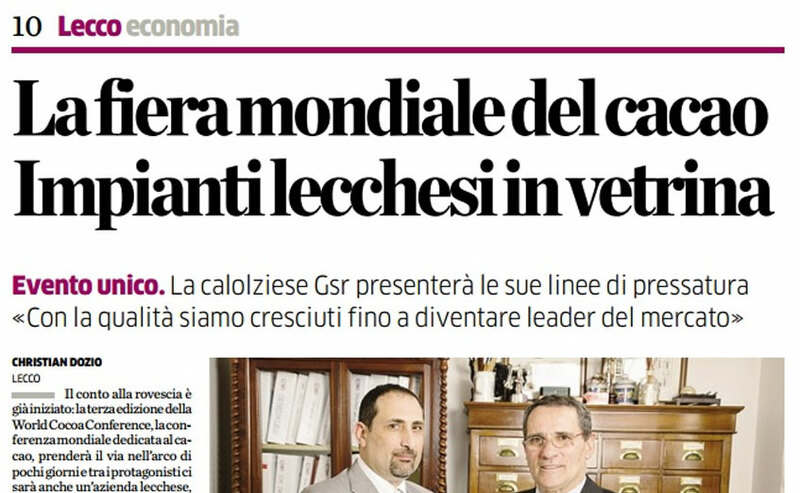 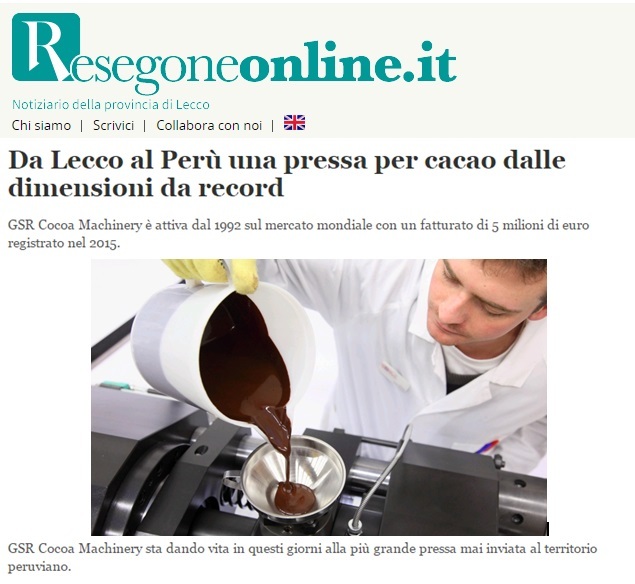 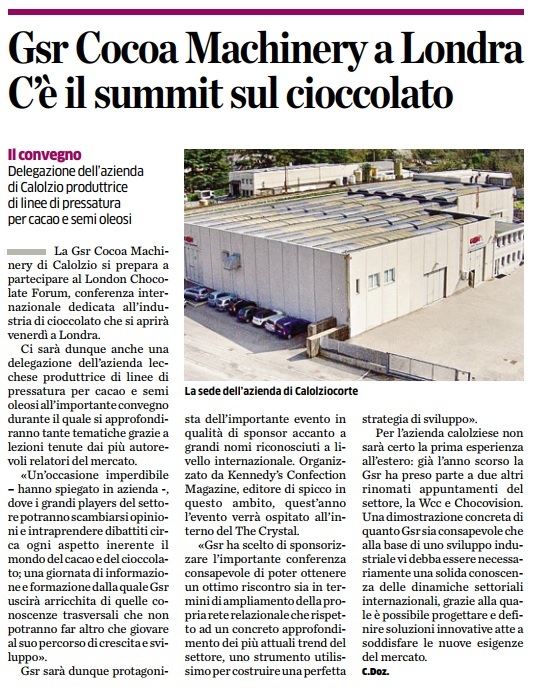 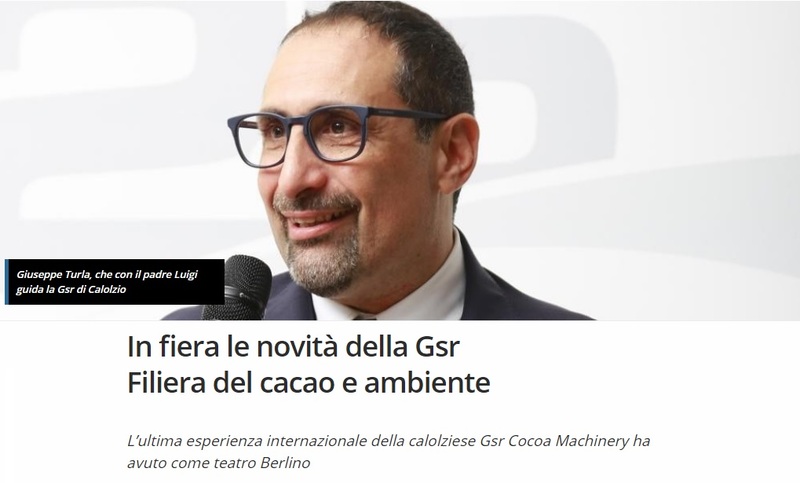 The company confirms its desire to revolutionize the sector to the beat of innovation also next year: in fact, there are rumors about two “Made in Italy” innovations, both dedicated to the world of cocoa and oilseeds for large and small productions. 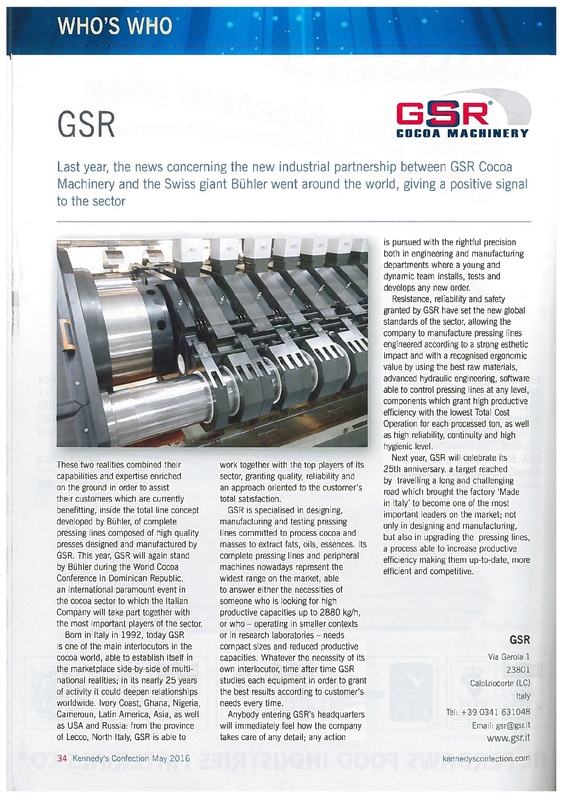 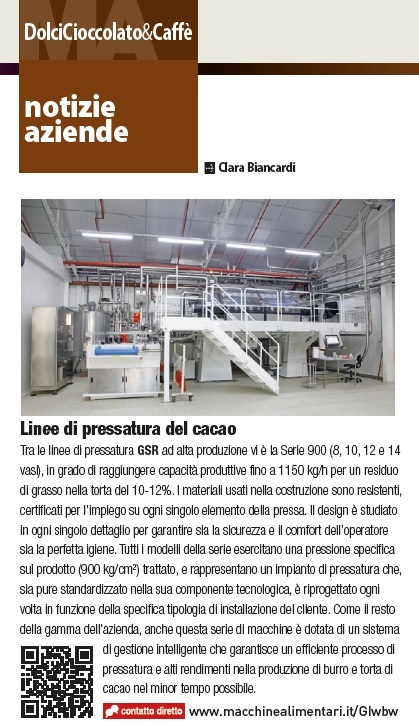 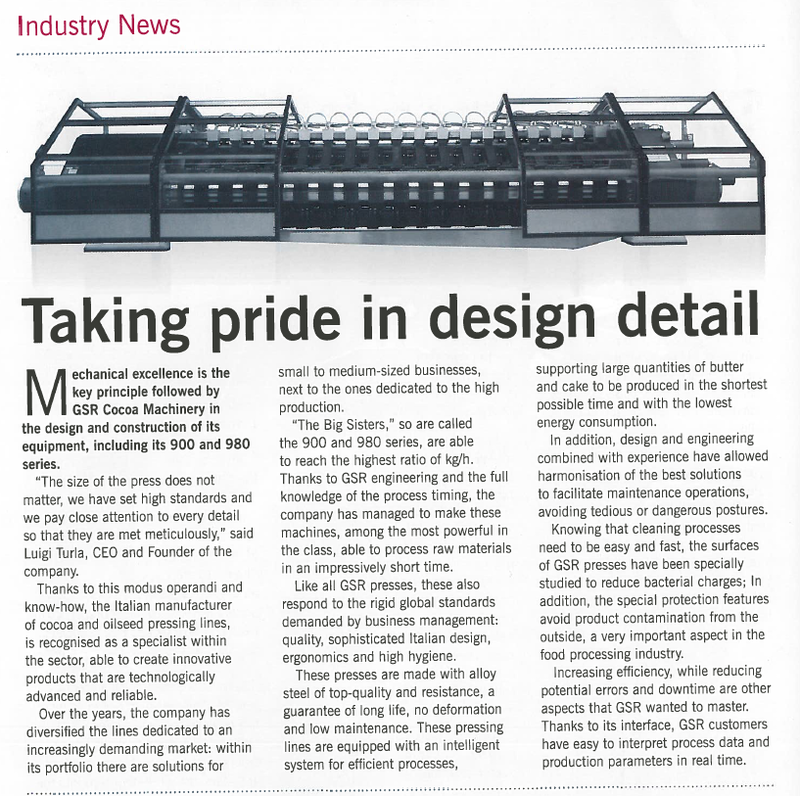 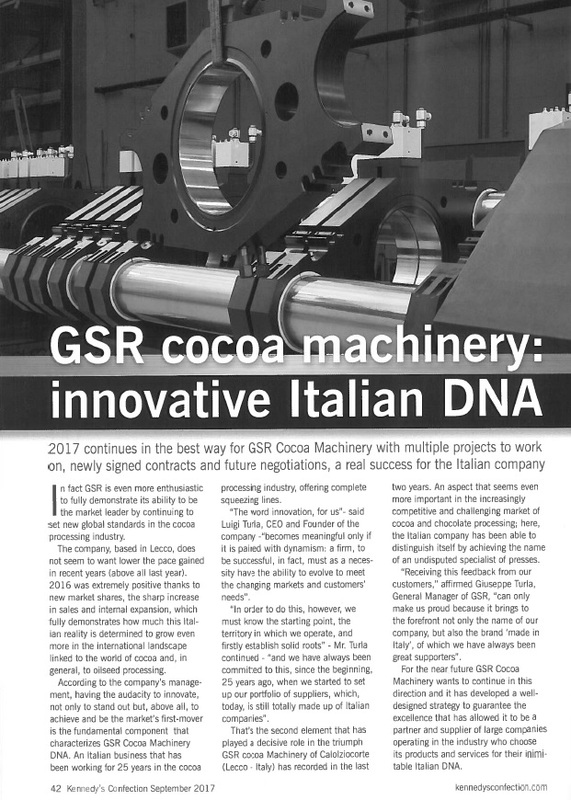 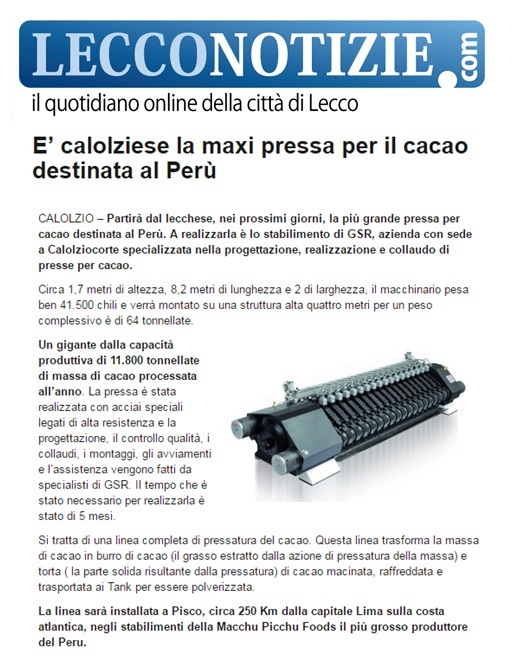 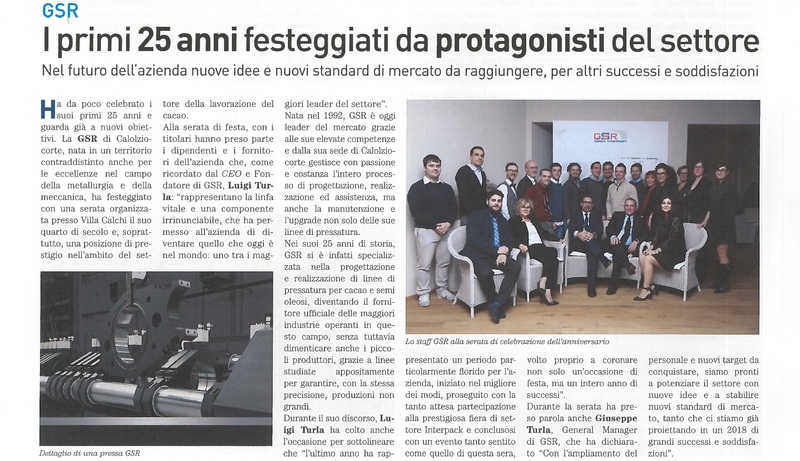 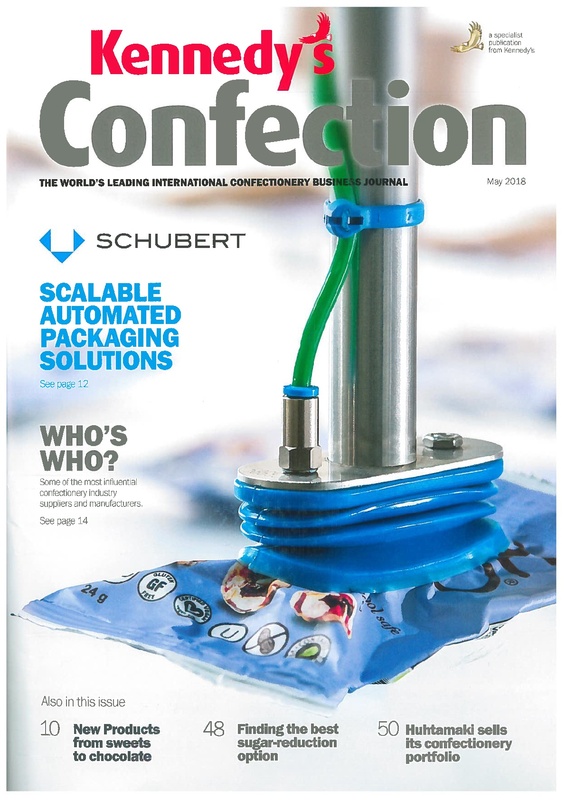 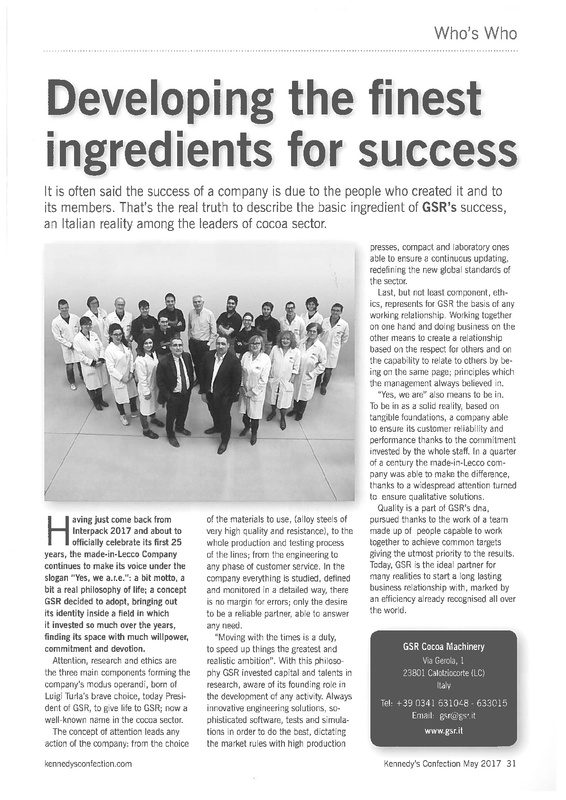 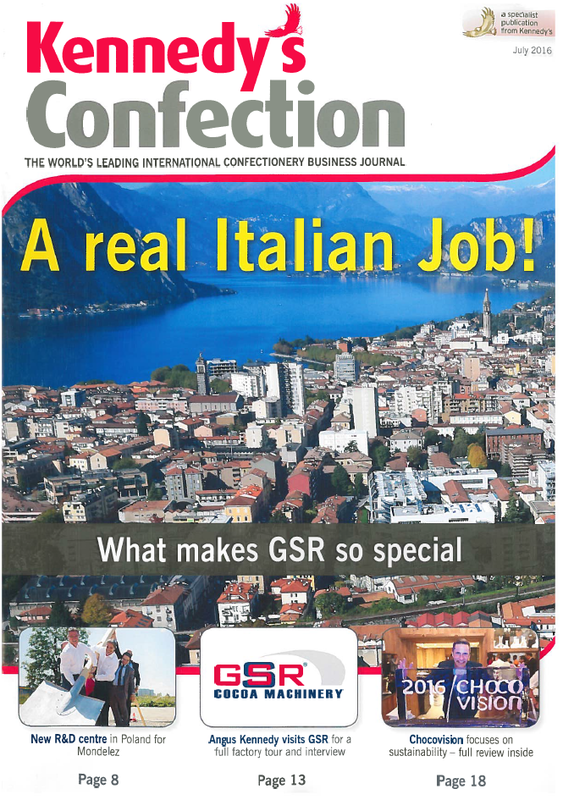 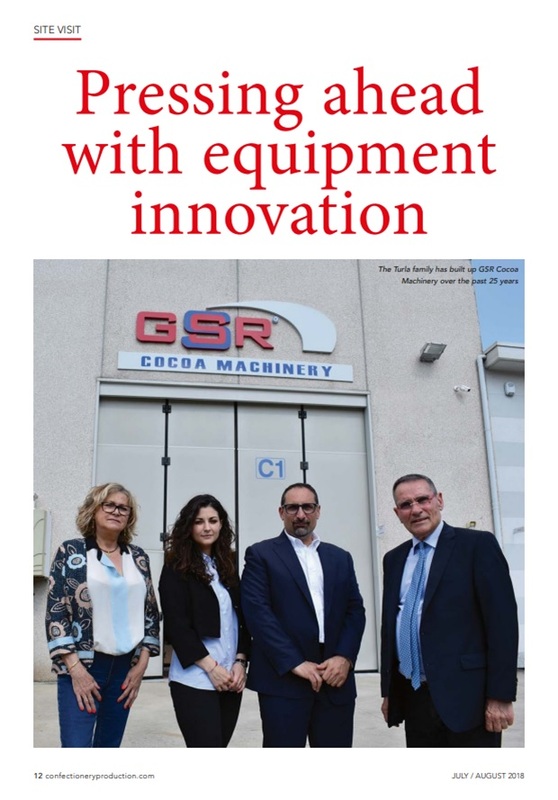 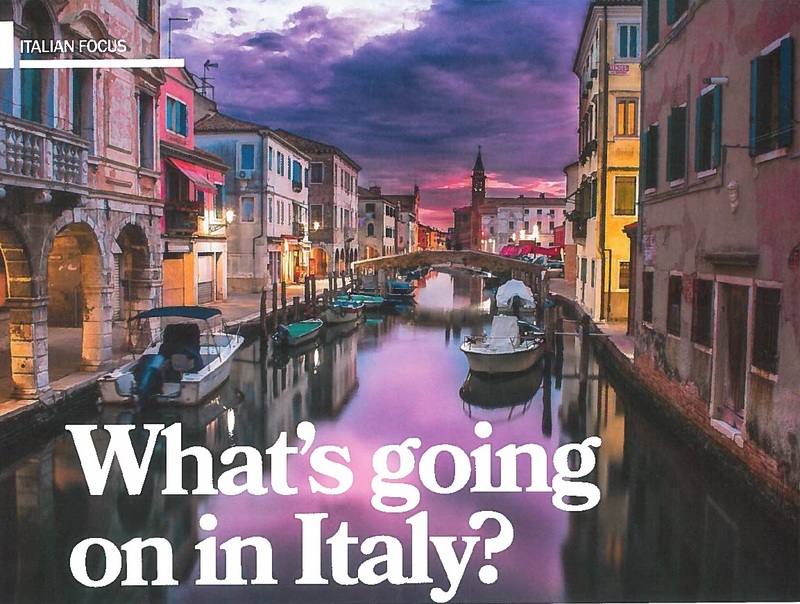 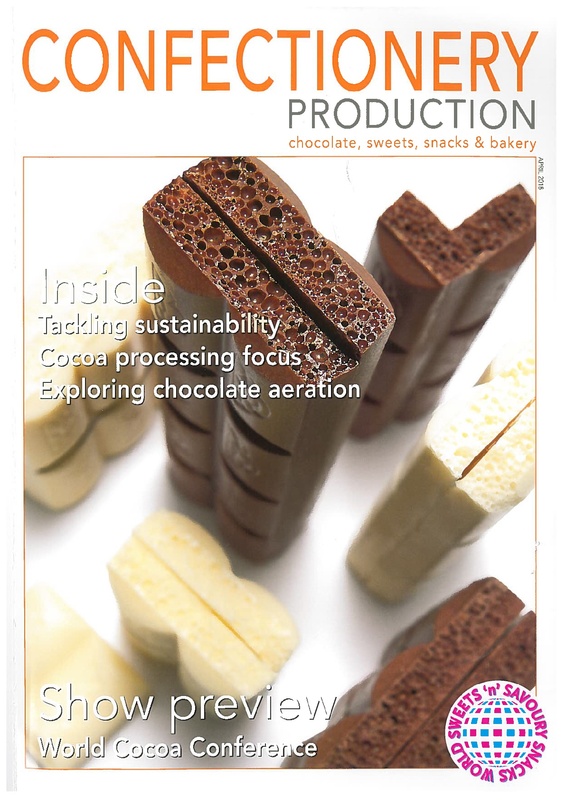 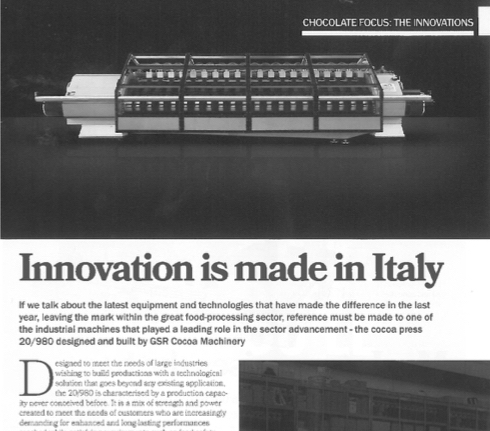 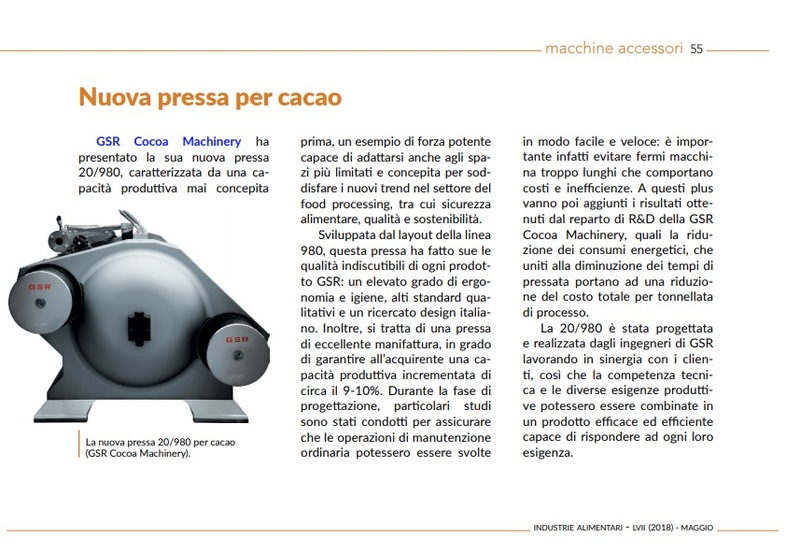 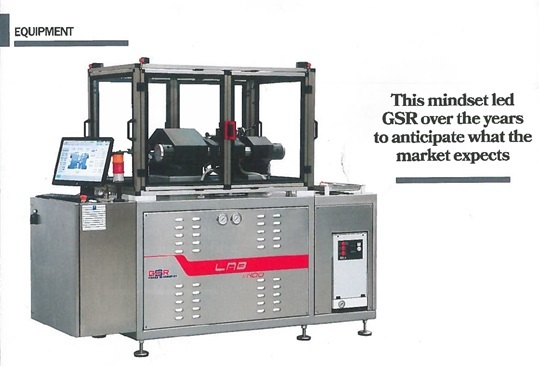 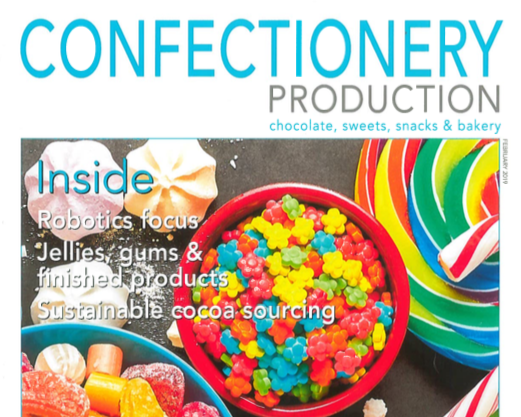 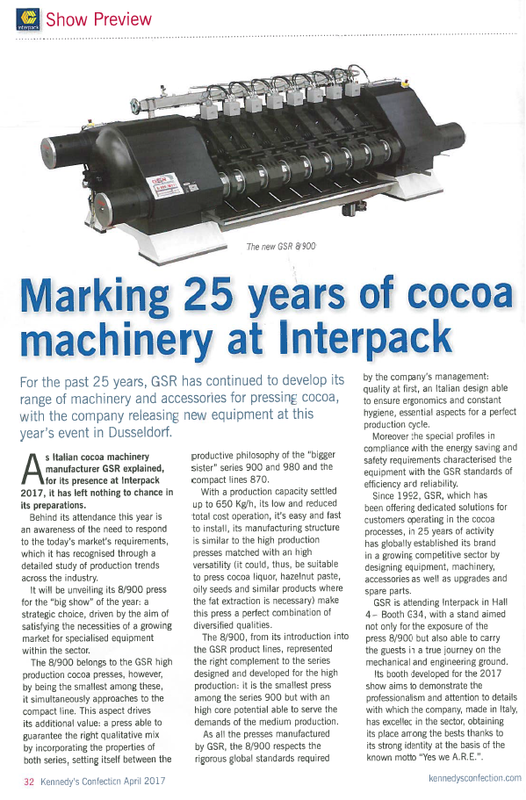 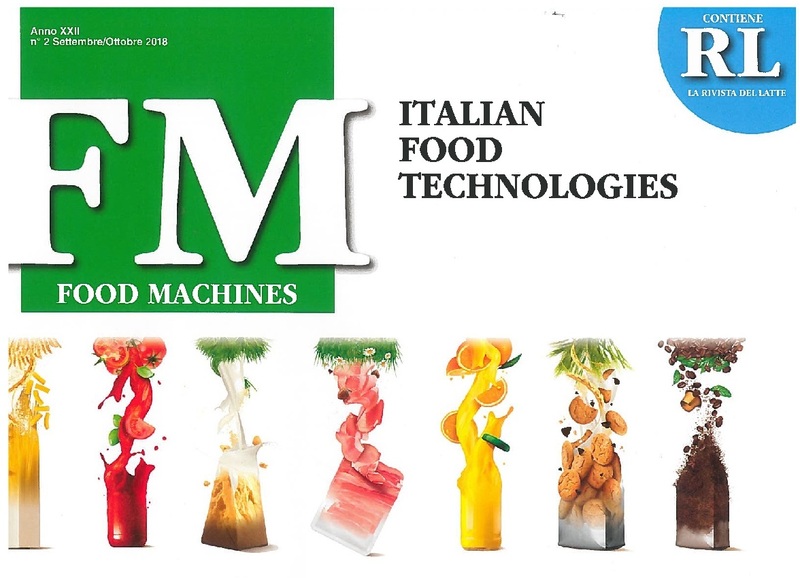 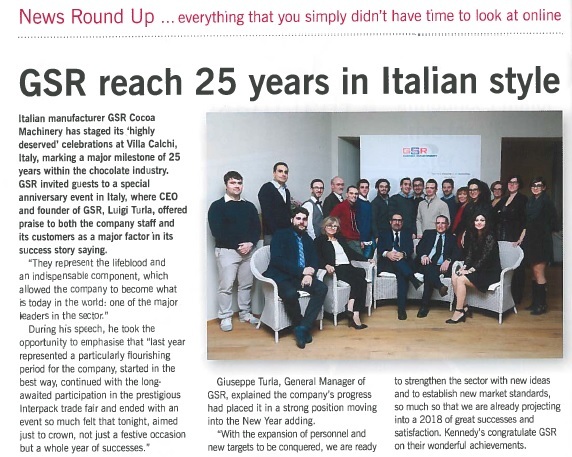 Though competition within the confectionery equipment market remains strong, Italy’s GSR Cocoa Machinery has stuck to its founding principles of focusing on quality and durability to deliver its latest range of cocoa presses. 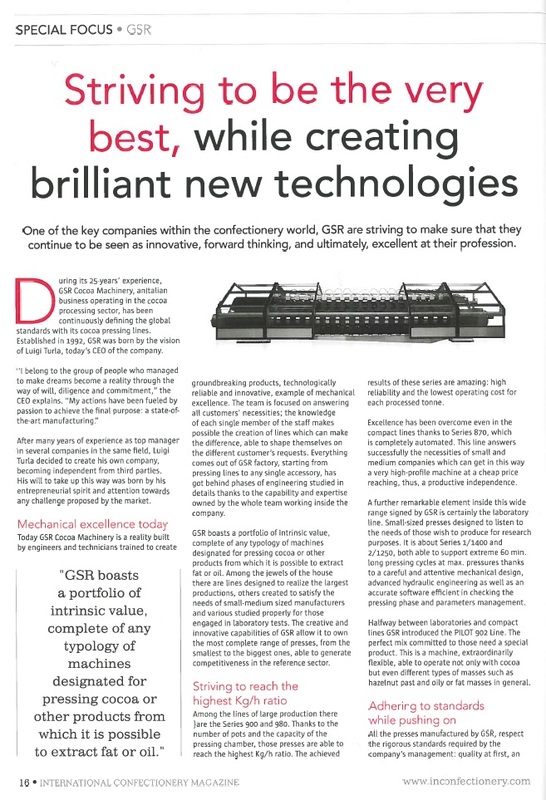 Neill Barston reports on its ongoing development. 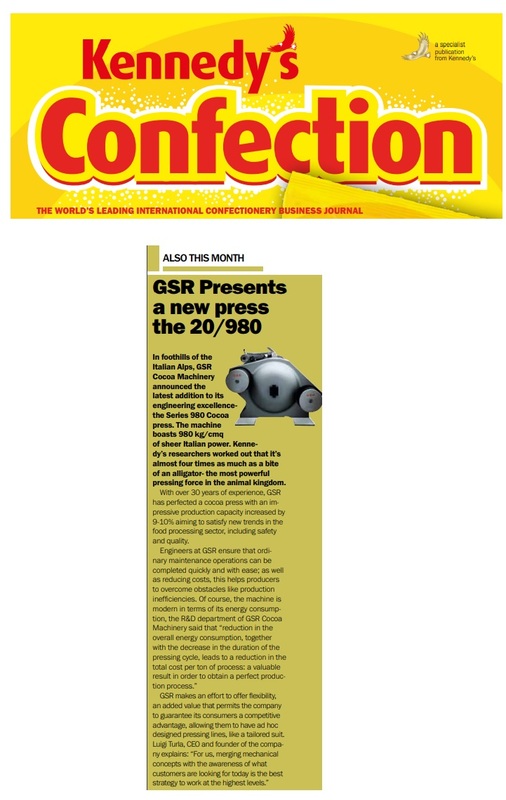 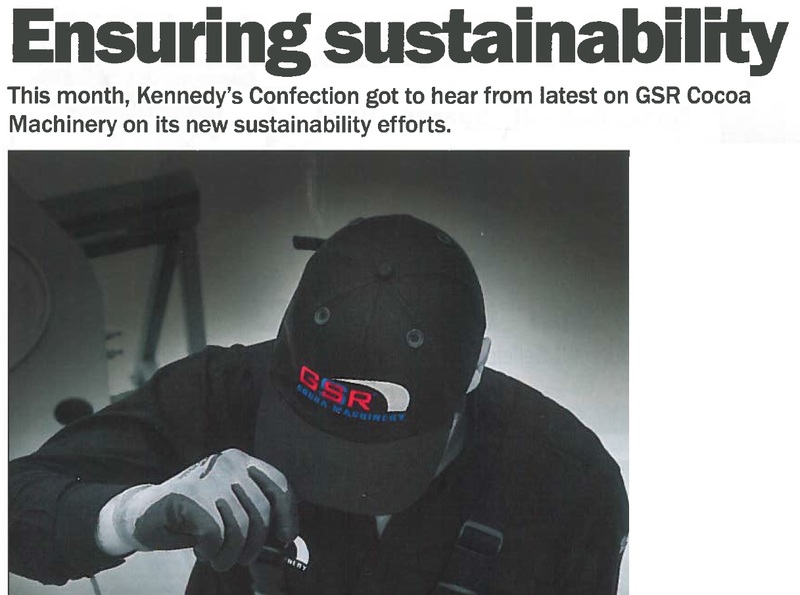 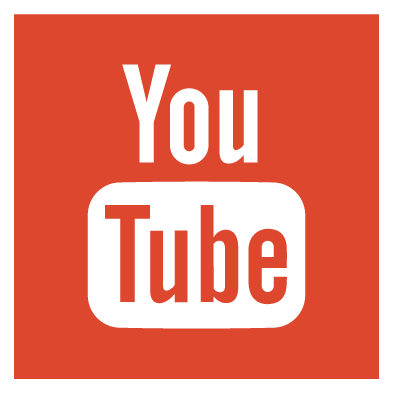 GSR has committed itself to ensuring sustainability through its products and services. 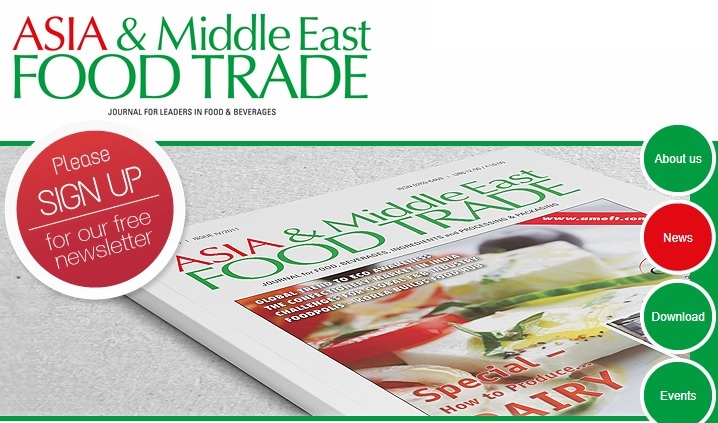 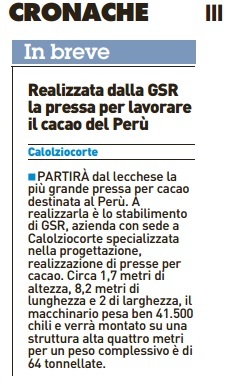 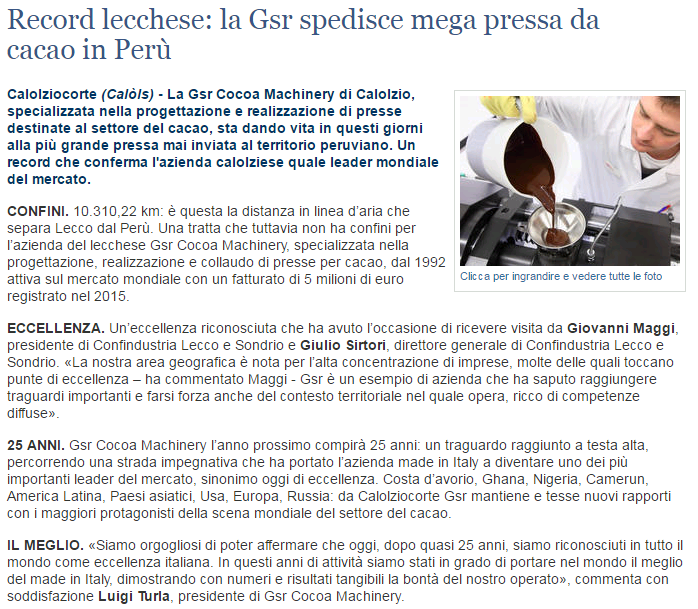 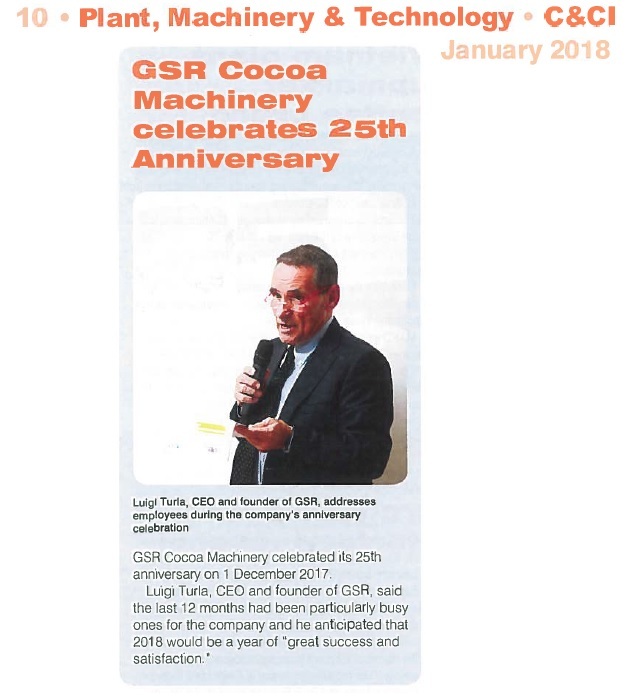 "As leader in a specific segment such as the pressing line, we have the duty to assume a high degree of responsibility and therefore adopt sustainable practices for the benefit of our customers”- affirmed a spokesperson from GSR Cocoa Machinery. 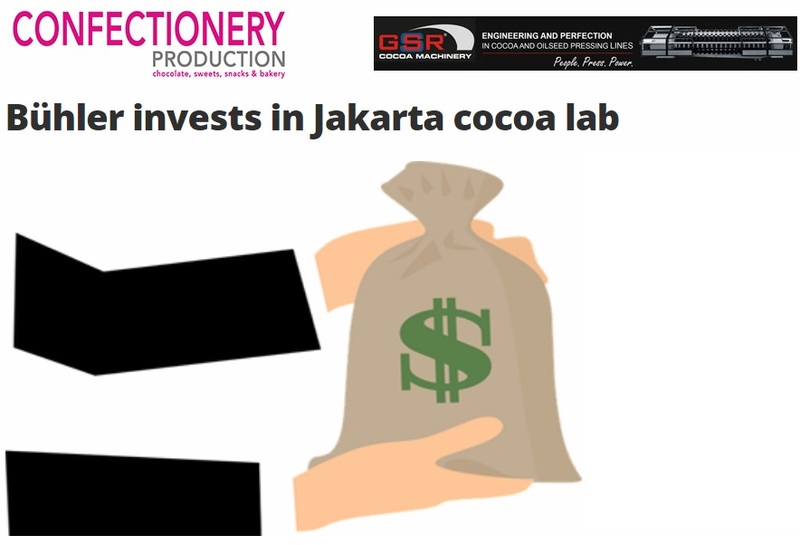 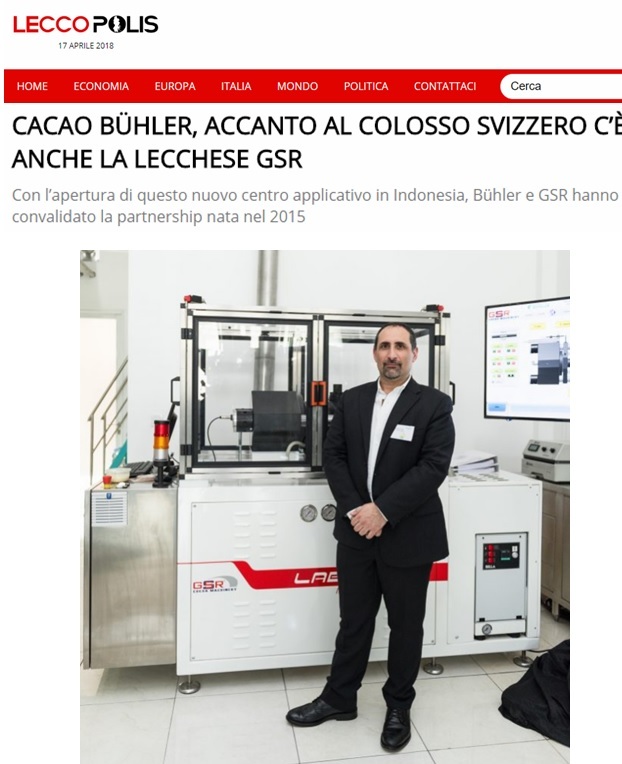 With the opening of the new application center in Jakarta, Bühler and GSR strengthened the partnership established in 2015: the GSR hydraulic cocoa press 1/1400 was installed inside the laboratory, in the department dedicated to the cocoa processing process and it completes the small-scale production line offered by Bühler. 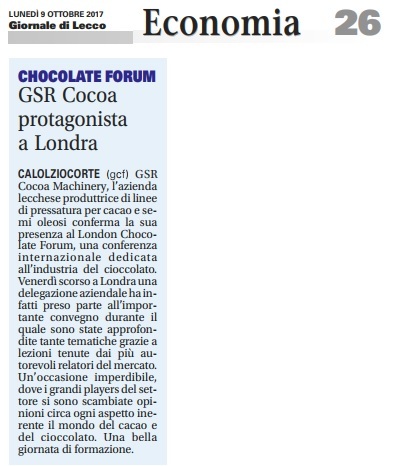 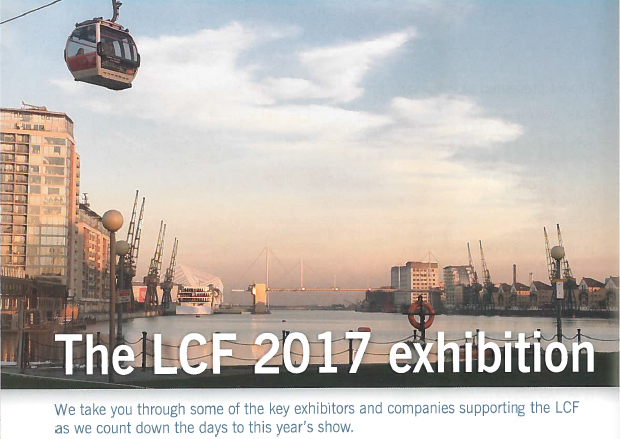 GSR has been one of the players of the LCF2017, an international conference and networking event dedicated to the chocolate industry. 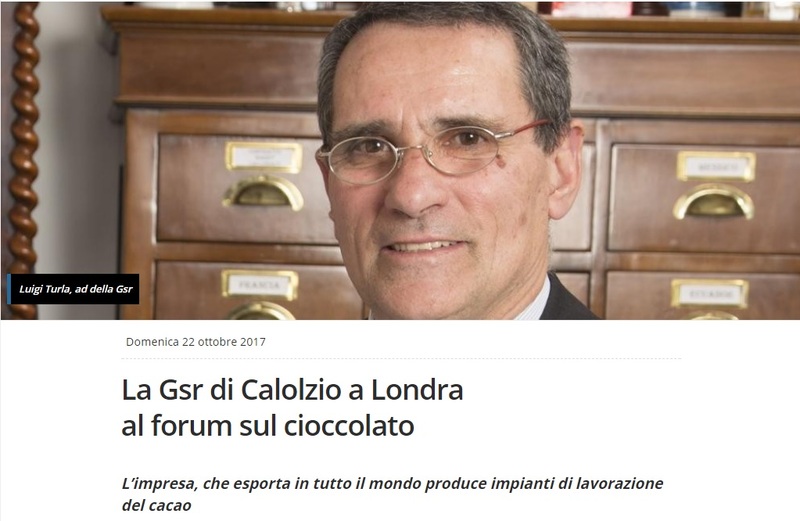 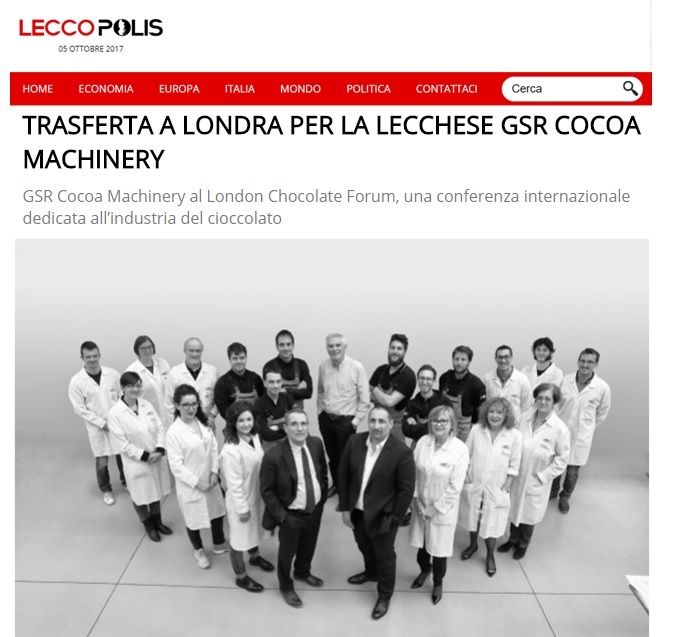 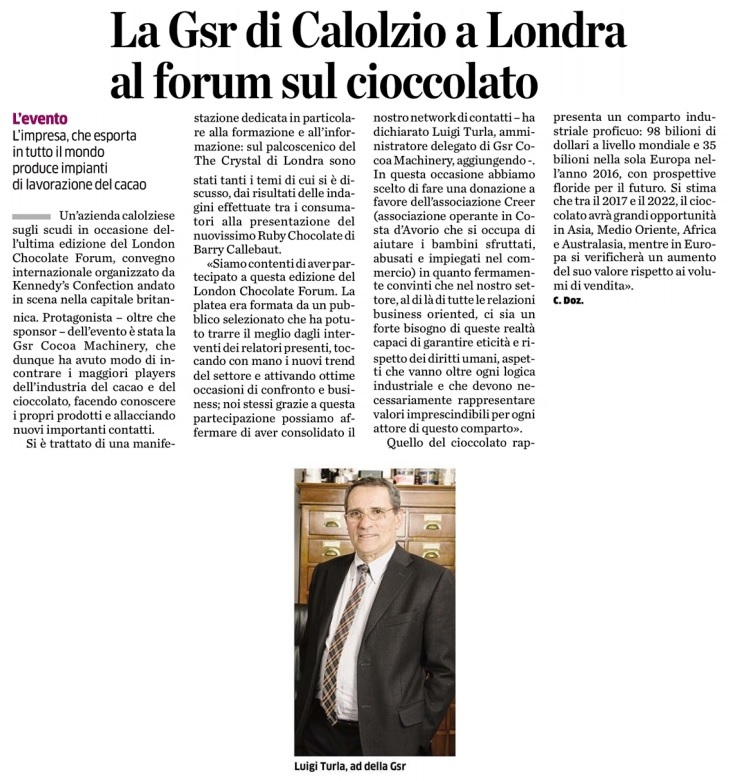 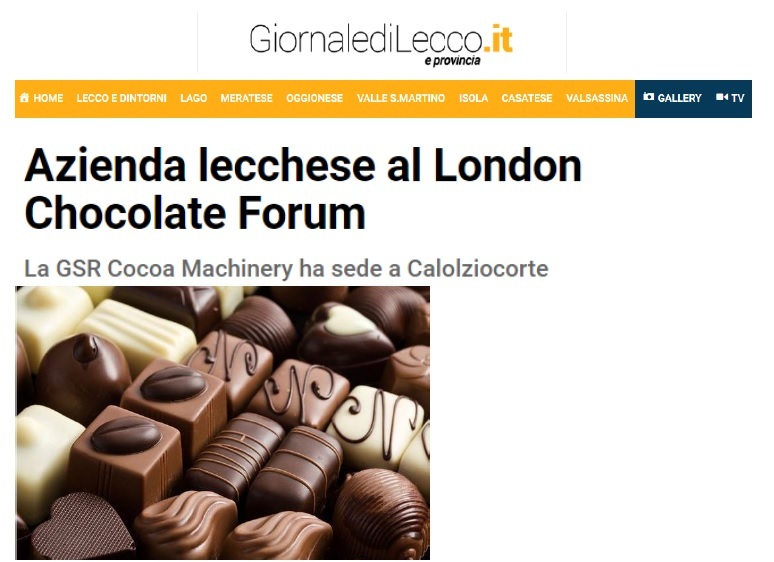 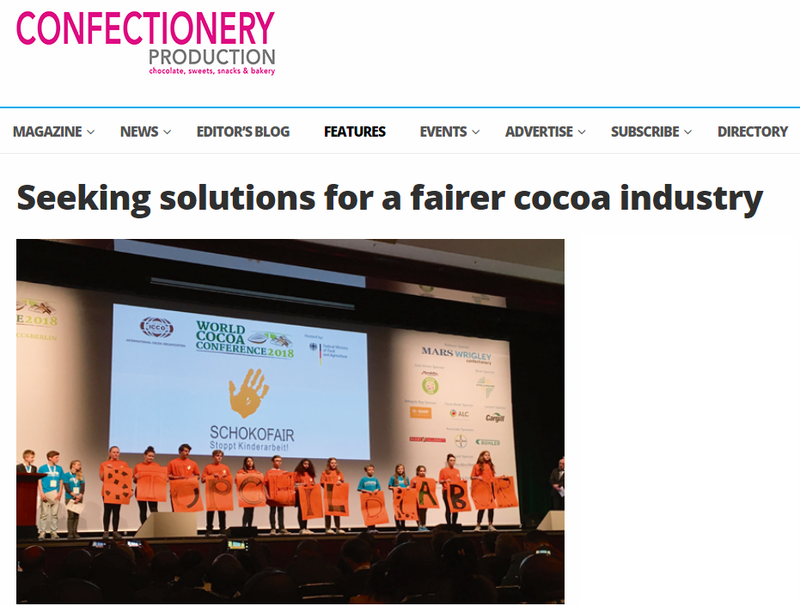 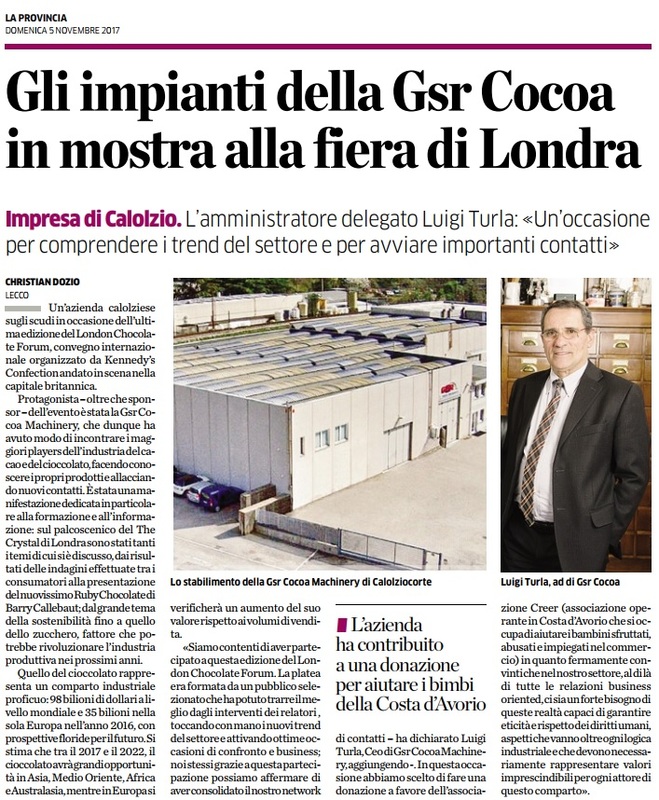 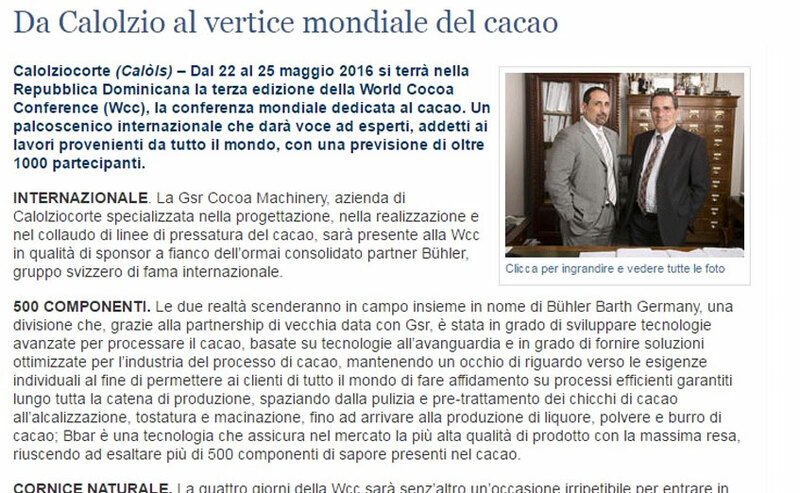 GSR Cocoa Machinery, the Italian company producing cocoa and oilseeds pressing lines, confirms its presence at the London Chocolate Forum, an international conference and networking event dedicated to the chocolate industry. 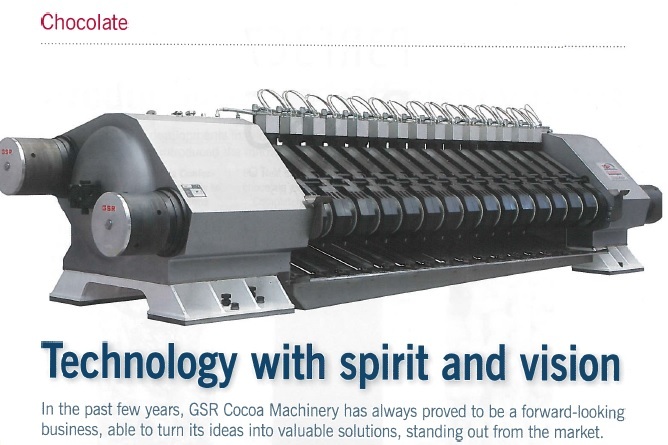 In the past few years, GSR Cocoa Machinery has always proved to be a forward-looking reality, able to turn its ideas into valuable solutions, standing out from the reference market. 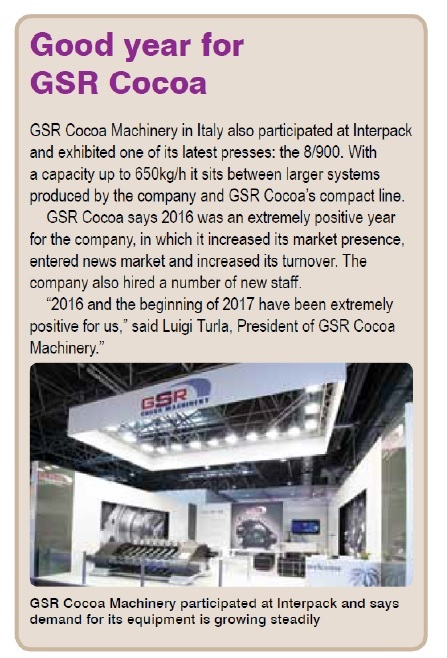 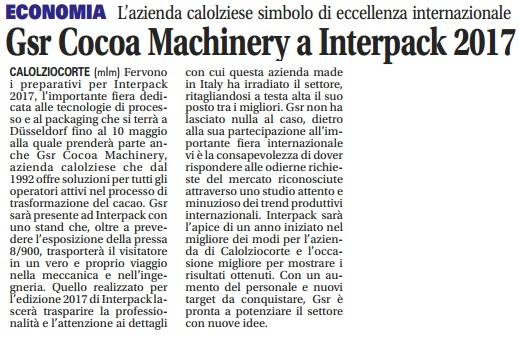 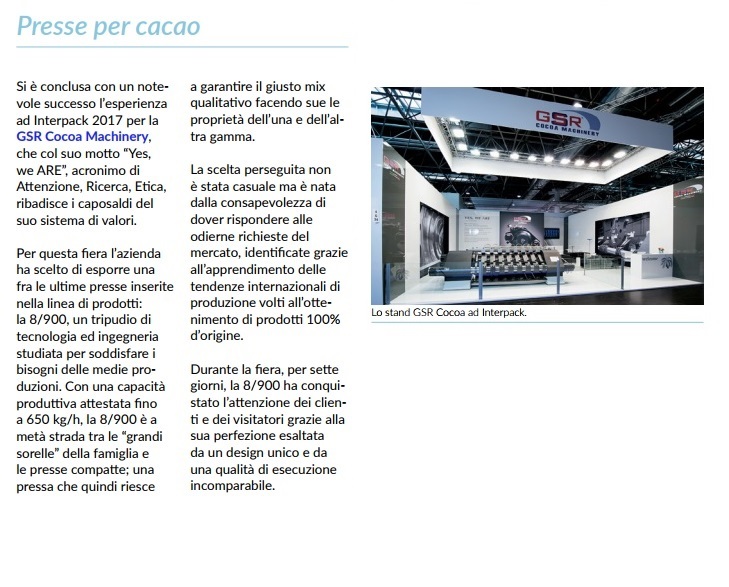 The experience at Interpack 2017 has ended in the best way for GSR Cocoa Machinery, the Italian company participated to the notorious fair trade by demonstrating the best of the professionalism “Made in Italy”. 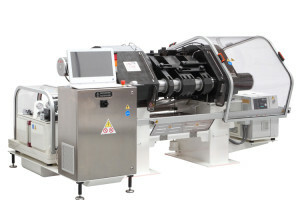 For Interpack 2017, the company has decided to exhibit one of the latest presses: the 8/900 is a blaze of technology and engineering, studied to serve the need of the medium production.